Perhaps Ginnah Muhammad, the woman suing in federal court for the “right” to wear a full-ninja face covering (a “niqab”), should be spend a few days in jail for contempt. Ditto for her terrorist lawyer Nabih Ayad. As I wrote earlier today, yesterday the pair told U.S. District Judge John Feikens that Muhammad has worn the full face veil since she was ten years old and that she only removes it while in the sole company of women. Muhammad is fighting Hamtramck, Michigan Judge Paul Paruk’s wise decision only to allow her to testify with her face uncovered. I thought you might want to put this on your article of Ginnah Muhammad, photographed in mixed, male and female, company clearly visible in the background. This waste of taxpayers’ money clogging up our court system is ridiculous. Exactly. Time for contempt proceedings. And monetary sanctions. Put it back on! Put it back on! Is that the same person as in the other picture? No matter whether you answer “yes”, “no” or “maybe”, she loses. These creatures that wear these masks are doing it to desensitize us so that male criminals can travel stealth right under our noses. Seperation of church and state. Religious beliefs and disbeliefs do not supersede the constitution and laws governing our country. Her religion gives her the right to murder the infidel so I’m sure the terrorists lawyers will start to use that as an excuse as to why our government can’t prosecute them. GACK! Put it back on. PUH-LEEEZ!! I filed a formal complaint with the taxi commission in NYC and had to go to court WITH HIM. He swore to tell the truth and then proceeded to lie through his Muslim teeth. This is normal for members of the Religion of Peace. By the way, the judge saw right through this Muslim liar (redundant) and fined him $250.00 on the spot. Where I come from she’s considered a “triple bagger”. Fox News’ E.D. Hill and Judge Napolitano had her on a few minutes ago. Of course, they never asked her to explain why she can’t show her face to a man, but most of the world’s other Muslim women are not under such an edict. 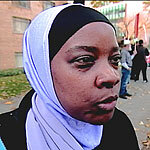 Notice, in that article, too, that Dear Ms. Muhammad stated, “It’s my choice”. She’s nasty and needs to be covered, obviously. The real problem was not that she is Muslim, but that she acted like a tantrum-throwing brat. Soldiers and police officers who risk their lives for America should definitely be allowed to substitute a yarmulke, hijab, or Sikh’s turban for the usual headgear of their uniform. The real problem here is judge Khalil needed to see her face for identification purposes. Religious freedom does not give the right to impede legal process. Too bad the judge can’t jail her for being a spoilt brat.